I hope everyone is having a good year so far. I am slowly improving my juggling technique and want to share my impressions of the road to getting to advanced juggling and the benefits of juggling. One of the worst things about juggling is it is very unforgiving of poor technique and effort. But this is also one of the best things about juggling. Not giving it your all means you are much more likely to drop the balls. You can’t fool yourself into thinking you are putting in more effort than you really are. It is often too easy to fool yourself with other forms of exercise, while walking or even running, on certain exercises machines, or doing martial arts or dance aerobics, etc. In this way, jumping rope is similar to juggling in that you can’t get away with poor technique – the rope will eventually catch your leg if you do it wrong. This is one of the reasons I sometimes recommend jumping rope as a prerequisite to fitness juggling. The rope won’t lie to you. In juggling, the balls won’t lie to you either. A good juggling form is a thing of beauty, and in beauty there is truth. This makes juggling balls one of the best, most accurate feedback mechanisms when it comes to fitness. They are an excellent teacher for so many different exercisers, even if juggling or joggling isn’t their main form of exercise. This would probably make joggling one of the best forms of cross-training for running – since joggling is less forgiving of bad posture than running, it would be a good idea to use your joggler’s posture while running, to ensure good form. Good form and coordination requires you to pay attention, to use your brain. Juggling is one of the very few exercises outside of playing some sports that targets your brain. Studies even show brain growth in parts of the brain that control movement. Think of the brain like a muscle – use it or lose it. It would require a whole series of posts or even a dissertation to explain why juggling is so neglected in the fitness world, and how to overcome this. 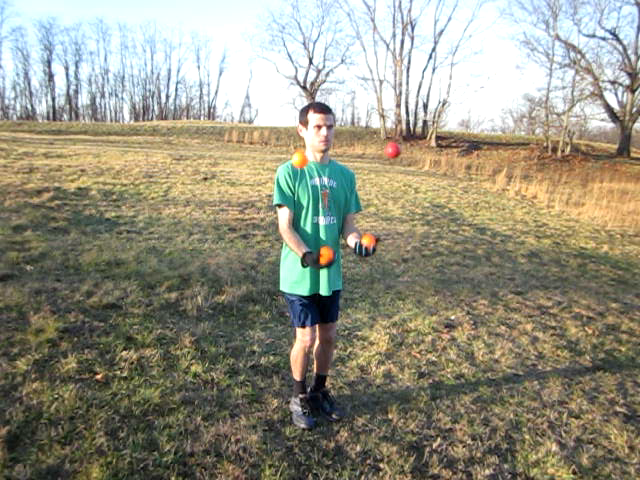 This entry was posted in equipment, exercise, fitness, joggling, Juggling, running, vegan and tagged beauty, benefits of juggling, brain, brain fitness, brain plasticity, fitness education, form, hand/eye coordination, neurology, New York, technique, truth, westchester county, winter sports. Bookmark the permalink.